If any one of you that currently residing this planet who does not what on Hell is Doraemon! Please! feel free to dunk your head at the nearest toilet bowl and rinse it very properly with filthy water using the same source. No kidding! Doraemon is probably one of the my early fav. childhood anime (*but with lousy translation*) beside causing the usual mayhem and destruction thru the house, school and etc. Wait a minute! 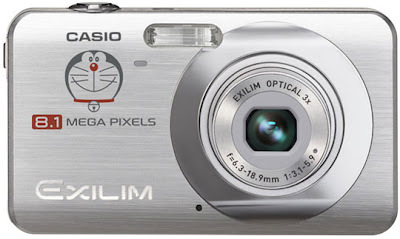 There something special for Doraemon fans AKA "The new Exilim camera from Casio mixes smile detection technology with Dora-chan to create a new experience for snapshot taking". Doraemon RULES even at snapping picture! "Doraemon face is used to give visual cues as to how the picture is going to turn out!" Left= ok, the pic is good! Center= Dude, u never taken a pic before iziiit! 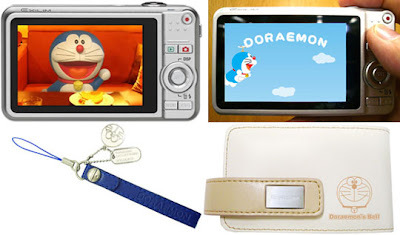 It come with own Doraemon body, case, and strap plus own Doraemon~style like menu with like "Pre-orders are already being taken for the camera, which will be officially released in December for about $350". What can I say more! Doraemon Rocks!